Peel and thinly slice enough onion to measure ½ cup [1 cup]. Coarsely chop enough additional onion to measure ½ cup [1 cup]; set aside for the squash and black beans. Cut the radishes in half, then cut the halves into thin half-moons. In a medium bowl, combine the sliced onion, radishes, and 2 tablespoons [¼ cup] lime juice. Season with salt and pepper and toss to coat. Let stand, stirring occasionally, while you prepare the rest of the meal. Brush the tortillas lightly on both sides with 1 to 2 tablespoons oil and season with salt. Arrange the tortillas side by side directly on the oven rack. Toast, using tongs to turn them once halfway through, until crisp, 12 to 15 minutes. Transfer the tortillas to a plate. While the tortillas heat, prepare the eggs. Bring a small sauce pot of water to a boil and fill a small bowl with ice water. Carefully lower the eggs into the boiling water and cook for exactly 6 minutes for soft-cooked (for firmer yolks, cook 1 to 3 minutes longer). Transfer the eggs to the ice water to cool. Carefully peel the eggs. While the eggs cook, prepare the squash and black beans. Cut the squash into ½-inch pieces. In a large frying pan over medium-high heat, warm 1 to 2 tablespoons oil until hot but not smoking. Add the chopped onion, season with salt and pepper, and cook, stirring occasionally, until starting to soften, 2 to 3 minutes. Add the squash and cook, stirring often, until lightly browned, 2 to 3 minutes. Stir in the black bean spice blend and cook until fragrant, about 30 seconds. Add the beans and cook, stirring occasionally, until heated through, 2 to 3 minutes. Remove from the heat and season to taste with salt and pepper. While the squash and beans cook, prepare the garnishes. Transfer the tortillas to individual plates. Top with the squash and beans, pickled onion and radishes, and eggs. Crumble the queso fresco on top, garnish with the cilantro, and serve with the lime wedges. Stir the pickled onion and radishes. 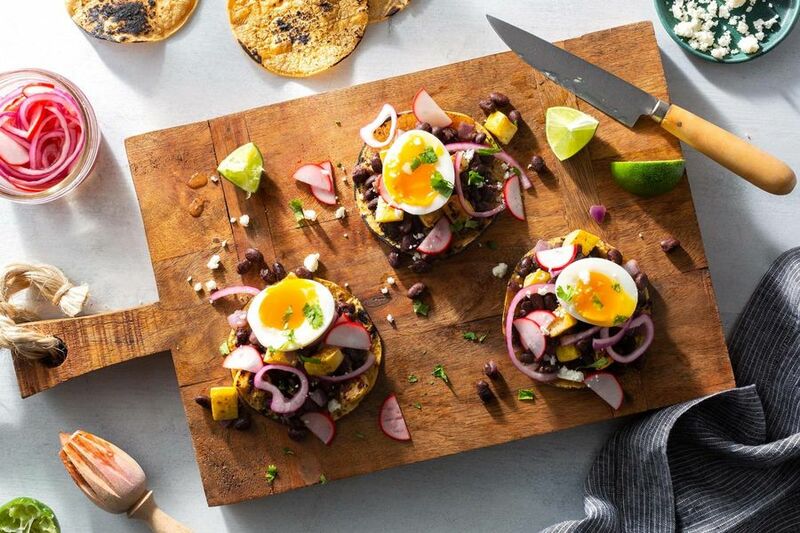 These easy vegetarian and gluten-free tostadas combine earthy black beans and seared summer squash with crisp pickled red onion and radishes. The tortillas can also be crisped on the stovetop: In a large frying pan over medium heat, warm 2 to 3 tablespoons oil until hot but not smoking. Working in batches, add the tortillas and cook, turning once, until crisp, 2 to 4 minutes per side. Season with salt. Quick pickles boast all the salty-sweet tang of their naturally fermented counterparts but require a fraction of the time. Natural fermentation relies on lactic acid and bacterial cultures to slowly transform brined vegetables set out at room temperature into tart treats. Quick pickles use a stronger brine and sometimes heat to achieve similar results but much more . . . quickly. Calories: 540, Protein: 20g (40% DV), Fiber: 13g (52% DV), Total Fat: 25g (38% DV), Monounsaturated Fat: 14g, Polyunsaturated Fat: 2.5g, Saturated Fat: 5g (25% DV), Cholesterol: 170mg (57% DV), Sodium: 250mg (10% DV), Carbohydrates: 56g (19% DV), Total Sugars: 12g, Added Sugars: 0g (0% DV).